Each month we’ll be posting a “drill of the month” and sending it out with each order. Try it out on your next trip to the range and if you post it on Facebook or Instagram be sure to tag us. The top shooter each month will win a special prize! 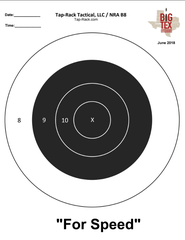 1) You must video yourself showing a clean target, shot timer with completion time, and completed target without interruption. 2) You can download and attempt the drill as many times as you like. Your best score will be your official entry. 3) Line breaks count as the next highest point. Must be a clean line break and not a "fracture" or "hair break". Final determination will be at our sole discretion. 4) In event of a tie, the shooter with the most hits in the "x" ring will be the winner. If a tie still exists then the lowest time will determine the winner.